I spent time this past summer browsing on the internet and reading teacher comments on Twitter. One of my favorite things is to watch TedTalk videos. I kept coming across ideas that what we teach students will be obsolete in 40 years, many future careers have not been invented, how fast knowledge doubles, advances in artificial intelligence, brain research, etc. So, what’s a teacher to teach? Or more importantly, what is it that students must be able to know and do to thrive in a future world full of unknowns? You may have additional thoughts but some of mine are students must be literate, be adaptive, be problem solvers, be able to think-outside-of-the-box, use technology, communicate effectively with others, work with others, and re-invent themselves in the workplace. Then, for the first time in my long career, my school adopted a partial block schedule with the first 2 days of the school year being block days. Students need to have positive experiences so they want to come back the next day plus I didn’t want to bore them. So, I wrote the Gidgee Gadget lesson. Take a look below to see what it’s all about! Line students up in order of their birthdays and then divide into small groups. Begin with this prompt (in assignment):You are growing up in a world that is changing very fast. You have the internet. Artificial Intelligence is advancing. Things keep changing. Knowledge doubles in 12 months and maybe soon will double in 12 hours. Much knowledge will be obsolete in 40 years. Experts say many of you will have careers that have not yet been invented. So what does a person need to know and be able to do, to get ready for a lifetime of such unknowns? Share ideas as a whole class and then introduce the Gidgee Gadgets…Nobody knows what Gidgee Gadgets are (I made up the name) but your group is about to invent some. You will have to think creatively and work together to solve a problem. Some things will require you to carefully follow directions but other things are up to your imagination. Of course you will have to clean up after yourselves!Here we go!…. Step 1: Make play dough. 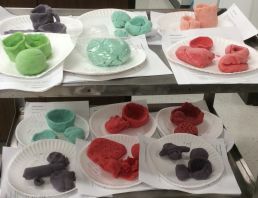 Watch the teacher demonstrate how to make play dough. Work with your group to make a batch of your own. Recipe found below. Step 2: Read the requirements below. Use your play dough to solve the problems. Make the objects and save them so we can see them later. (Do not wad up your play dough and use it over and over!) You have ____ minutes. Make an object suitable for holding liquids. Make an object suitable for separating solid objects from liquids. Make one of your objects as lightweight as you can. Make one of your objects able to roll down an incline plane. 5.If you have time, make your objects look as interesting or as unique as you can. Step 3: Finish and clean up. Get a paper plate. Write your names and period number on it. Put your play dough objects on the plate along with any extra play dough. Put this paper under your plate and place the plate where the teacher says so it can dry. Wipe play dough crumbs into the trash can from your table and chairs. Sweep the floor or wipe with a damp paper towel to pick up crumbs. Use a damp cloth to wipe the table. Wash your hands. Step 4: Quick answers…..Answer together as a group. How many objects did you make? Did your group make objects that fulfilled all of the requirements? What was the point of this lesson? If you are expected to make a creative project, should teachers grade it? Why or why not? If so, how? What should their criteria/rubric be like? Step 5: Write an essay at least a paragraph long. (Be sure your answer is a smart answer and use the RACES technique.) Prompt: Are all people smart? What makes a person smart? What do you think you will need to know and be able to do in the future to be a successful person? Explain your answer.